How do I answer "Do you have tags"? The site will only prompt you with this question if one of the matching hunts requires that you have a tag for that state and species. This is a complicated issue in that each state that requires tags have their own unique set of rules and policies that are different from every other state. On top of that, the license/tag system for most states change often to some degree. Many states allow hunters to draw for tags while also allowing outfitters to transfer/provide tags to their clients. Also, tags may be required to be drawn for a particular season and/or weapon, but for other seasons/weapons, they can be purchased over the counter. Furthermore, some states will provide enough tags for all that apply and some will only provide a small percentage - especially for Trophy areas. Finally, since our site allows you to pick up to 3 states, only 1 may require tags, but that will cause the site to prompt you to select a "Tags" answer. The best advice we can offer is to check the Game and Fish Department of the state(s) you're interested in to learn about their license/tag rules. If you know the answer to this question, by all means provide that info to the outfitter. If you're not sure, just leave it blank or if it's early in the year, select "Will Apply". Most tag application deadlines are in the late spring or early summer and, as mentioned earlier, some are guaranteed or provide a high chance to draw. You can never go wrong by submitting an application for a tag for a state/animal you wish to hunt. Even for those states that allow outfitters to transfer a tag to you, you will sometimes have to pay more than you would for a tag you drew yourself. I'm interested in a particular time frame for my hunt. How do I provide that data? The Find A Hunt form requires that you enter a Month (or Season) and a Year. If you have a particular set of dates for your hunt, enter that information in the Comments box on Step 2 of the Find A Hunt form. I'm not sure exactly how many hunters will be in my party at this point. How should I enter this required data? Err to the low side. Since outfitter's pay for leads based on the Hunter's Budget multiplied by the Number of Hunters in the party, this is the fairest option to them. You can also elaborate on your Hunting Party's size in the Comments box. What happens after I enter my trip and contact information? Click the "How Site Works" link in the site menu for details on what happens after you enter a Hunting or Fishing Lead. What information should I enter in the Comments box? Tag information when applicable - State, Game Unit, Weapon, Bonus Points, etc. Preferred hunt method(s) as applicable - i.e. 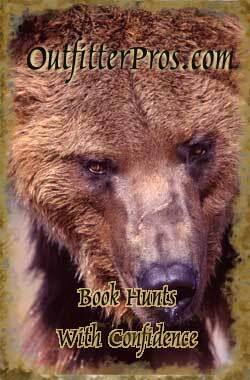 hunt with hounds, spot and stalk, hunt bear over bait, rattle in deer, etc. 1x1, 2x1, semi-guided, self-guided, drop camp, etc. Specific hunt dates if applicable. You will be required to enter a Month (or Season) and Year. I'm an Outfitter and am interested in having my hunts listed in the database. How do I do that? Click the "For Outfitters" link in the site menu. That page will give you all the info you need. It will also contain a form for you to contact us to start the process.